Thanks for taking part in the poll ' My 10 Most Winning Wing Chairs '. 64 votes were tabulated over 5 days. Patricia Gray writes about emerging trends, her inspirations, "What's HOT" in the world of Design, as well as sneak peaks of her work. Spring is around the corner and I am inspired by these bright and cheerful colors. I received this rendering of a Master Bedroom that I designed from Michelle Morelan,a talented artist who writes the Blog A Schematic Life. Thanks Michelle and keep up the good work! Traditionally a wing back chair was an upholstered easy chair with large "wings" mounted to the armrests and enclosing the head or torso areas of the body. Such wing back chairs were originally designed to provide comfortable protection from drafts, and particularly to trap the heat from a fireplace in the area where the person would be sitting. Hence, they were most often used near a fireplace in historic times. So the wing back chair started out to function in rooms that were not centrally heated. We have come a long way since then and the wing back chair has morphed to fit the times and the style of the rooms we live in. Please leave a comment at the end of this article and let me know which is your favourite wing back chair. Bergère Chair by Autoban for De La Espada,is available in Black walnut or White Oak with oiled finish. The De La Espada factory is located near the Silver Coast in Portugal. Gabriel Chair by Oly Studio is beautifully upholstered in leather with nail heads. Sam Chair by Oly Studio a more casual look in cane and ebonized black frame. Leo Chair by Oly Studio A stunning look in white leather and nail heads. It is upholstered in Maserati leather. B & B Italia designed by Antonio Citterio, an updated classical look by the famous Italian Architect Citterio. Slip covered and very comfortable to sit in. 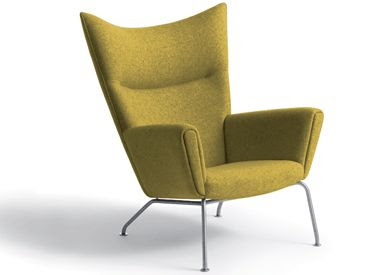 CH445 Wing Chair by Hans J. Wegner from Suite NY. This chair was designed by Hans J. Wegner in 1960 and reintroduced in 2006. A modern take on the Scandinavian look. The Marks Lounge Chair by Michael Taylor Designs. Designed in the 70's by the famous Californian designer Michael Taylor. This is my idea of the perfect bed. My Motto is "When you live with beautiful things, you stimulate your mind, you enjoy life a little more." I have a tray in my bathroom that I look at everyday that holds some of my most favourite things. It makes me happy every time I look at it, and isn't that what makes life worthwhile to find beauty and happiness in the little things. The Ivory necklace that I got when I was on Safari in Africa brings back fond memories. The little Hermes bag that is filled with fragrance samples that I got as a gift when I made a purchase at Hermes -the orange color and the delicate brown ribbon makes me smile. My favourite fragrances: Jo Malone & Cartier. The Louis Vuitton zippered case, lined in brown suede holds my favourite pieces of jewelry. The engraved silver lidded bowl that holds my watch and bracelets at night. The two crystal silver toped jars, the taller one is a Victorian sugar shaker that I have re-purposed to hold talcum powder and the smaller one is a vintage ink well that now holds a small portion of my favourite cream. Why not try rounding up a collection of some of your favourite things that make you happy every time you look at them. This picture was sent to me by my good friend, Colin Kwok, who is an Architect and an extraordinary Sculptor. It is the Barcelona Pavilion designed by Ludwig Mies van der Rohe. I thought I would share it with you as it is very inspirational for me. I would love to visit Barcelona and view this sculpture in person one day. Enjoy. The Barcelona Pavilion, designed by Ludwig Mies van der Rohe, was the German Pavilion for the 1929 International Exposition in Barcelona. It was an important building in the history of modern architecture, known for its simple form and extravagant materials, such as marble and travertine. The building stood on a large podium alongside a pool. The structure itself consisted of eight steel posts supporting a flat roof, with curtain glass walling and a handful of partition walls. The overall impression is of perpendicular planes in three dimensions forming a cool, luxurious space. Ludwig Mies van der Rohe designed the Barcelona chair for the Barcelona Pavilion, hence the name for the chair. The Barcelona Pavilion was dismantled at the end of the exhibition, but a replica has since been built on the same site (1981-1986 replica Barcelona Pavilion by Ludwig Mies van der Rohe). Click here to see a posting I did on the above of Colin Kwok's sculpture titled: Jeanne d' Arc in a client's bedroom. This video just melts my heart. As a fellow animal lover I think this clip will astound you! For those of you who read this by email click here to view the video. 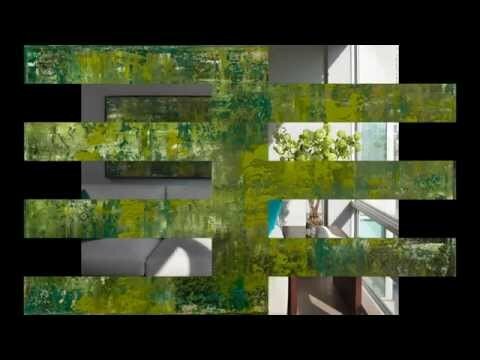 In the past year (2008) I have noticed a proliferation of large scale abstract art being used in living rooms and dining rooms. The effect is bold and dramatic and creates a strong focal point in a room. Most of the rooms shown in the pictures below are large in scale architecturally and benefit from a strong focal point. Over scale in size shows abstract art to it's very best. Abstract art is non-representational and lets an eclectic array of furnishings and accessories stand on their own merits as works of art. Abstract art is beautiful and organic in nature...... Enjoy the slide show. Definition of Abstract Art: A cluster of theoretical ideas lies behind abstract art. The idea of art for art's sake – that art should be purely about the creation of beautiful effects. The idea that art can or should be like music – that just as music is patterns of sound, art's effects should be created by pure patterns of form, colour and line. The idea, derived from the ancient Greek philosopher Plato, that the highest form of beauty lies not in the forms of the real world but in geometry. The idea that abstract art, to the extent that it does not represent the material world, can be seen to represent the spiritual. In general abstract art is seen as carrying a moral dimension, in that it can be seen to stand for virtues such as order, purity, simplicity and spirituality. For those of you who read this by email click here to view the slide show. and travel, as well as how your surroundings can influence the world around you. 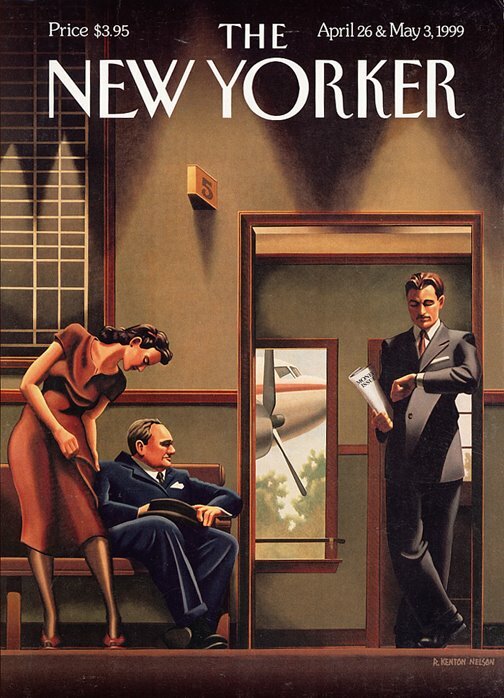 Kenton Nelson's paintings and artwork have appeared in numerous films over the years including, Father of the Bride II, The Parent Trap, What Women Want, Mission Impossible 3, and perhaps most famously seen here in Something's Gotta Give, with a special recognition by Jack Nicholson. The painting shown is titled Swim Party. 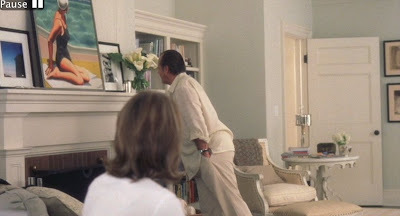 The painting of the Lighthouse in the Family Room of the set Something's Gotta give is also by Kenton Nelson. 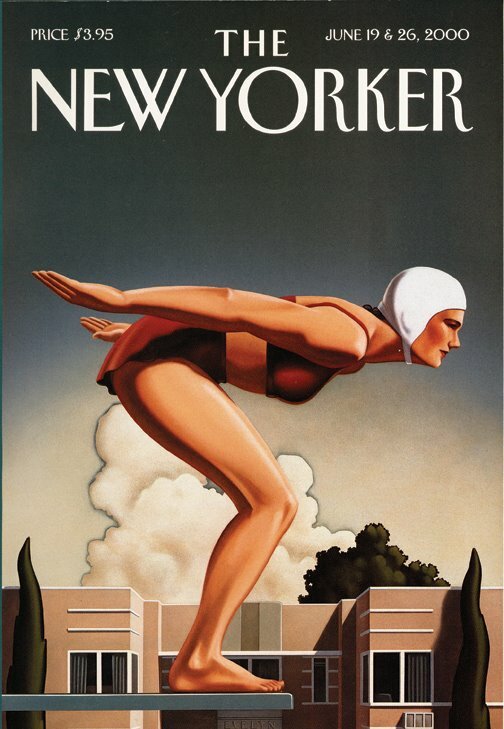 Kenton Nelson was born in 1954 in Los Angeles. He attended Long Beach State University then the Otis Parsons Art Institute, and for the past 27 years has been operating an art studio in Pasadena. He has been on the faculty of the Otis Parsons Art Institute in Los Angeles and the Academy of Art in San Francisco. 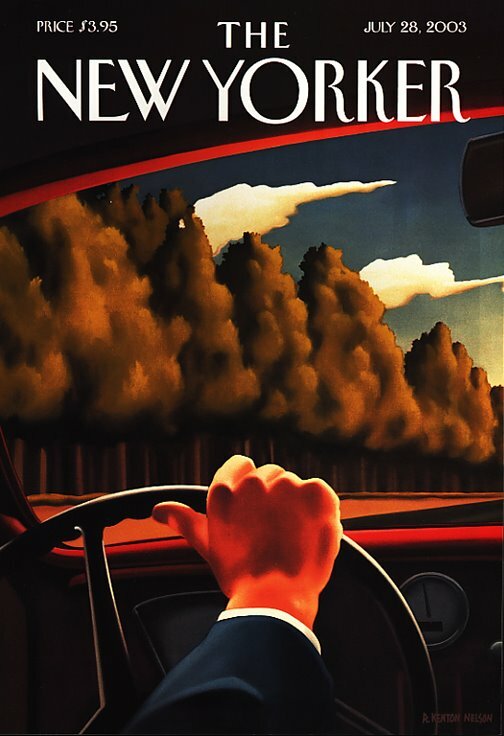 The New Yorker has used Kenton Nelson for cover images over the years. 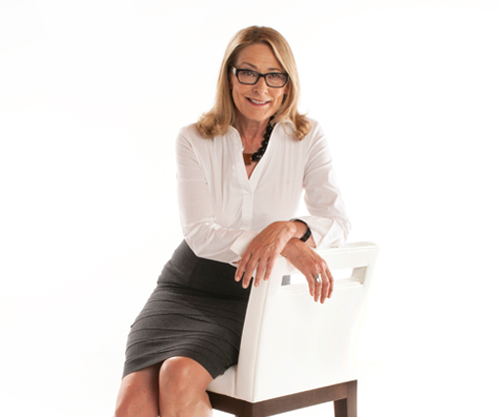 PATRICIA GRAY INC is an award winning interior design firm writing about the world of interior design, architecture, lifestyle, and travel.